I would like to see a blow to the head never as a target in sport. The brain is too important to allow that. We can fix so many sports injuries but the brain is not one we are very good at fixing. At McMaster’s sport rehab centre, Dr. David Robinson says he treats more female soccer players with concussions than male soccer players. Robinson, a primary care sports medicine doctor at the David Braley Sport Medicine and Rehabilitation Centre, is concerned that soccer concussions are not taken as seriously as head injuries sustained while playing hockey or football. McMaster’s state-of-the-art rehab facility sees to the sports injuries of varsity athletes and the surrounding community, including kids and adults playing on various house leagues. Robinson says they encounter an average of three to four concussions on a daily basis. A new study published Monday in the journal ‘Brain Injury’ confirms Robinson’s concerns and experiences as a sports medicine doctor. The study published by Dr. Tom Schweizer, director of the neuroscience research program at St. Michael's Hospital, found a higher incidence of concussions in female soccer players. Schweizer and his co-researchers were even more concerned by a lack of data relating to head injury and concussions in soccer. Concussions sustained while playing soccer account for 15 per cent of the total number of concussions in all sports. Schweizer explains that the sheer number of concussions sustained in soccer surprised him. And the data studying its impact on the brain pales in comparison to data and research conducted for hockey and football concussions. “There is no reason to think that because it’s soccer, the concussions are less dangerous. What it comes down to for me as a doctor seeing concussions every day is that no one should get hit on the head ever again,” Robinson said. After a child comes in with a concussion, Robinson often hears parents panic and say they will pull the child out of hockey and put him or her in soccer. “I just say, ‘see you in a few months,’” he said. The softer attitude to concussions in soccer has a lot to do with insufficient information and training, says John Gibson, president of the Hamilton and district soccer association. Gibson who started playing soccer at age eight and has coached soccer for over 30 years says his biggest concern is that coaches and players are not recognizing concussions early enough. “As coaches, we need more training to recognize it early enough and not send the player back on the field,” he said. Schweizer’s study is a literature review of currently available research examining injury and cognitive effects of concussions and heading in soccer. Schweizer says it is not clear based on the data why women seem to get concussions more than men. The study also goes a step further. Heading the ball is an integral part of soccer and unique to the sport. This is an aspect that also has received little to no attention from researchers. Schweizer says he wants to shed light on this information vacuum. There is significant concern in the scientific community that repetitive heading of the ball may have long-term cognitive consequences for athletes, he says. “The practice of heading, which might occur thousands of times over a player’s career, carries unknown risks but may uniquely contribute to cognitive decline or impairment in short or long term,” Schweizer said. Schweizer and four other colleagues searched several databases for articles from 1806 to May 2013 and 49 articles relating to the impact of heading the ball. Another study found professional players reporting the highest prevalence of heading during their careers did poorest in tests of verbal and visual memory as well as attention. 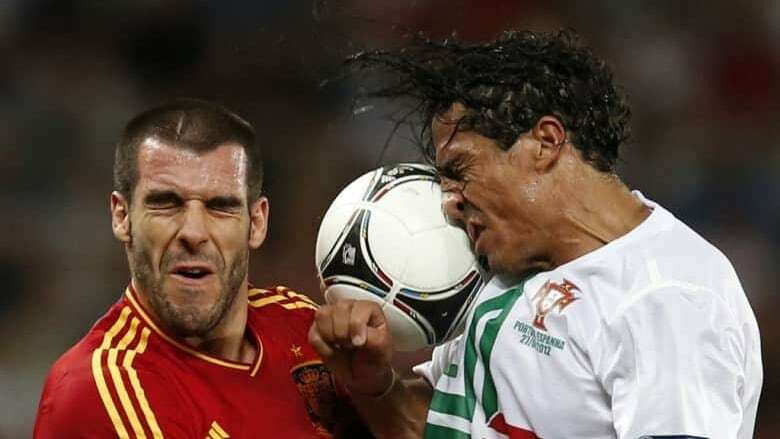 Because heading the ball – the purposeful use of the head to control the ball may not cause obvious symptoms of concussion, its impact remains unknown on ignored. “Sub-concussive” head impacts – blows to the head not causing symptoms of concussions – may still in fact have the same long-term cognitive effects seen in patients who suffer serious head injury. “You’ve got a ball flying through space with momentum and you are using your head to stop that momentum,” Robinson said. Monica Maher, co-author of the study and former varsity goalkeeper at the University of Toronto, says the research aims to emphasize injury prevention methods, especially in young children playing the sport. Maher recommends the use of protective headgear, padded goal posts and limiting heading exposure especially in younger children. So while the long-term effects of heading the ball in soccer are still being studied, prevention is key, especially in children who have not developed the neck muscle strength to execute a safe header, according to Robinson, who himself plays hockey. “I would like to see a blow to the head never as a target in sport. The brain is too important to allow that. We can fix so many sports injuries but the brain is not one we are very good at fixing,” Robinson said.